As my boys are growing up, and can now tell me what they like and don’t like, I’m having fun changing up the decorations in their rooms with them. My oldest son Matthew especially enjoys picking out pictures to hang in his room, and is always asking me for something new to hang on his walls. So when the opportunity to review BoomBoom Prints surfaced, I knew he would love to sit with me and pick out a fun print for his room. I was given a $100 credit from BoomBoom Prints for this review. There are a lot of neat designs to choose from on the BoomBoom Prints site. 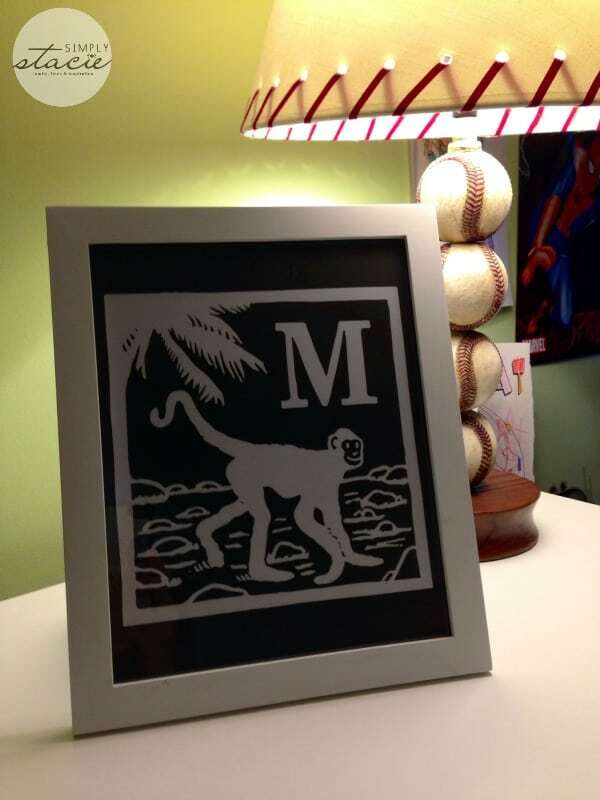 I thought, and my oldest son agreed, that an alphabet piece would be a great fit for his room. We choose an M from the Andrew Wightman collection on the site. We both loved the cute little monkey design of the piece. I thought an 8×10 paper piece would look nice in a simple frame, so I chose that option then clicked on the “change colors” icon to see our color options. We played around with some color combos and decided that we liked the ash and white combo of the sample piece. It was nice to be able to see live changes though as we played around with the different color combinations. It was also fun to be able to “view in a room” – where we were able to see how it would look in a boy/girl/play room with the color and size we chose. I think that’s a neat feature that really makes BoomBoom Prints unique. After we added our $19.99, 8×10 print to our cart, I headed off to find a piece for our bare playroom walls. I explored all the different categories and absolutely fell in love with the Playful Pup piece in the Sass & Peril collection. Both of my boys are in love with the two new puppies my parents now have, so I thought they would both appreciate this print. I thought this would look nice as a wrapped canvas print, and I chose the 14×11 size in a white and nautical blue color combo. 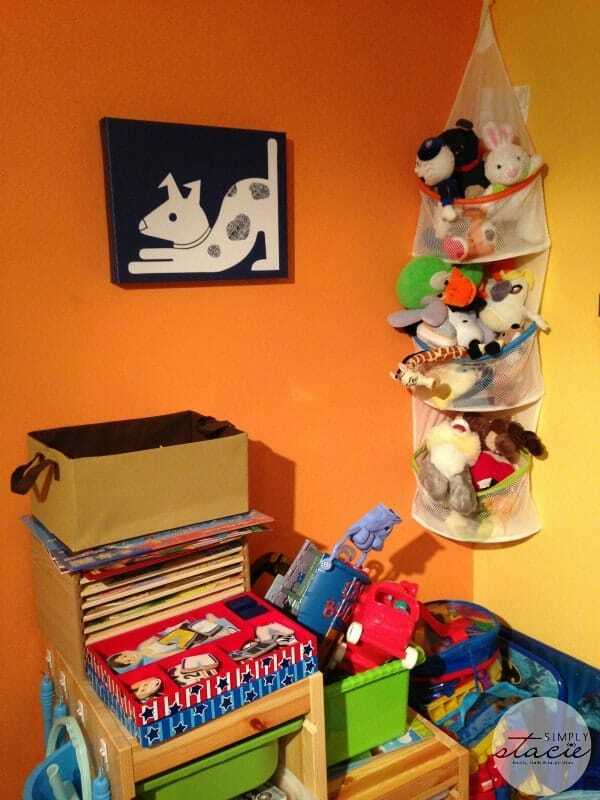 With bright orange walls in our playroom, I thought the darker blue would be a nice contrast. The 14×11 size wrapped canvas sells for $79.99 on the site. When the pieces arrived, I could not have been more pleased with the quality of both of them. The paper print is sharp and clear, and looks fantastic in the simple white frame we bought for it. It sits on Matthew’s dresser and I think it looks great and is definately a piece that will grow with him. The colors on this piece are so vibrant, and truly lives up to its “playful” description. It looks great against the bright orange walls of my playroom, and I think this is a piece that will work once the playroom becomes a game room as my boys get older. I think both of these piece are worth every penny! BoomBoom Prints has over a million color, style and size combinations to choose from, so there’s something for everybody – whether you are looking to decorate a nursery, a big boy/girl room, or a playroom. You can find great inspiration from the user-submitted photos on the site – it really helps bring the images to life, and along with the “view in room” feature on the site, really makes BoomBoom Prints unique and fun to use. They pride themselves on the superior quality of their designs and materials, and they create and ship their products on-demand. The idea behind the business was to give you the freedom to be able to pick a design you like and give you complete control over the colors, size, and medium you want. To see all that BoomBoom Prints has to offer, check out their website. I like the Flower 1 print. 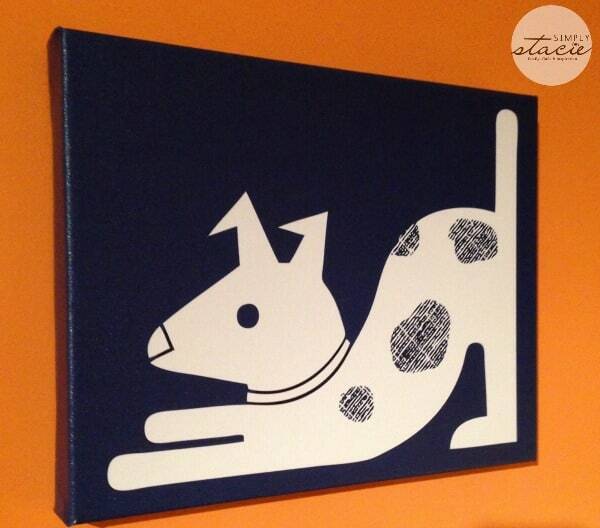 The Bleep print is adorable. It’d be perfect for my nephew who loves robots. I’d get the Alice in Wonderland 2 wrapped canvas print. I would purchase the Soccer Ball onesie. I would get a long sleeve onesie with a chock-a-block I on it. I would choose Tommy the T-Rex for my dinosaur loving son. Thanks for the chance to win.